Editorial’s main drawback is the lack of a Mac version. 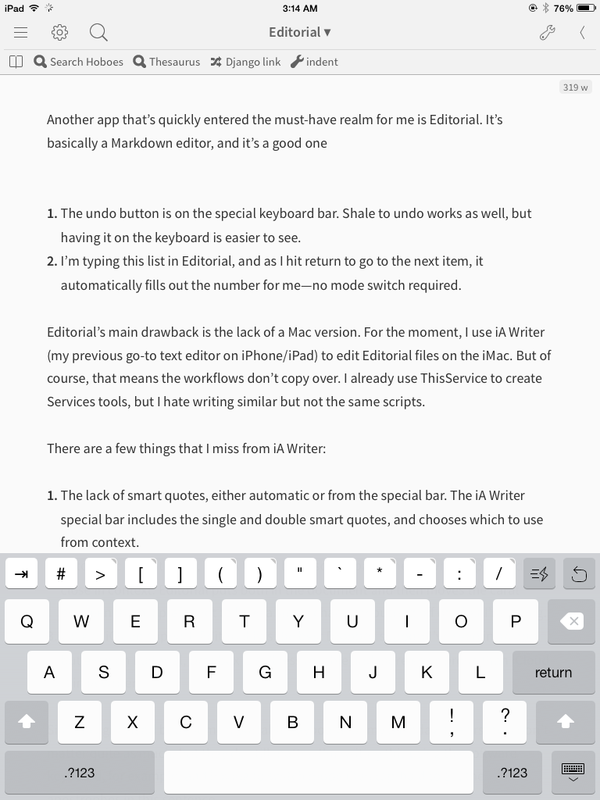 For the moment, I use iA Writer (my previous go-to text editor on iPhone/iPad) to edit Editorial files on the iMac. But of course, that means the workflows don’t copy over. I already use ThisService to create Services tools, but I hate having to duplicate scripts, especially when they need to be almost but not quite the same—once for inside Editorial and once for outside of it. The lack of smart quotes, either automatic or from the special bar. The iA Writer special bar includes the single and double smart quotes, and chooses which to use from context. Automatic parentheses; The iA Writer bar also has parentheses which open and close in context. Editorial puts both in the document and then moves the carat between them. I prefer not to have a single character pushed off of what I’m typing. Lack of iCloud support. Editorial has the best Dropbox support I’ve seen in an app, but even on Editorial, Dropbox is still less reliable and more error-prone than iCloud is in iA Writer. Since my girlfriend bought me a portable keyboard—the iWerkz foldable—for my birthday, the first two don’t matter quite as much, but they do still matter. I’m writing this using the software keyboard, for example, and having to switch mode then tap-hold to get the apostrophes in this sentence. That’s annoying. As for iCloud, I’m assuming that it works more reliably because it’s built in to iOS, but the reason it works better doesn’t really matter, only that it does. Twice while writing this I have had to resolve a conflict, something that was rare when using iA Writer. All that said, the live Markdown display was enough to switch to Editorial, and the workflows is enough to keep me using it. 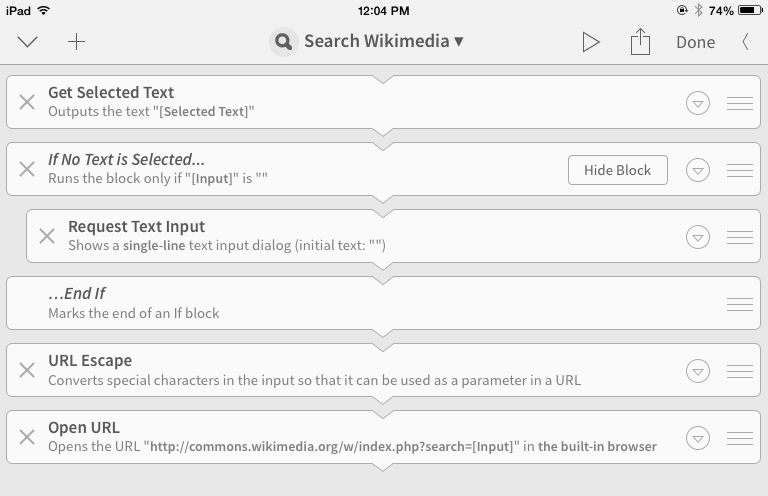 This workflow takes the selected text or, if no text is selected, pops up a dialog, and searches Wikimedia for related images. Folds up easily for sliding into a purse of man-bag or even a large pocket. Charges via USB, and connects via Bluetooth. The layout takes a little getting used to, especially the gap where it folds, but it is still a lot easier than typing on the screen. A script to edit scripts file, ensuring that the script exists and is recognized as a script file by the operating system. 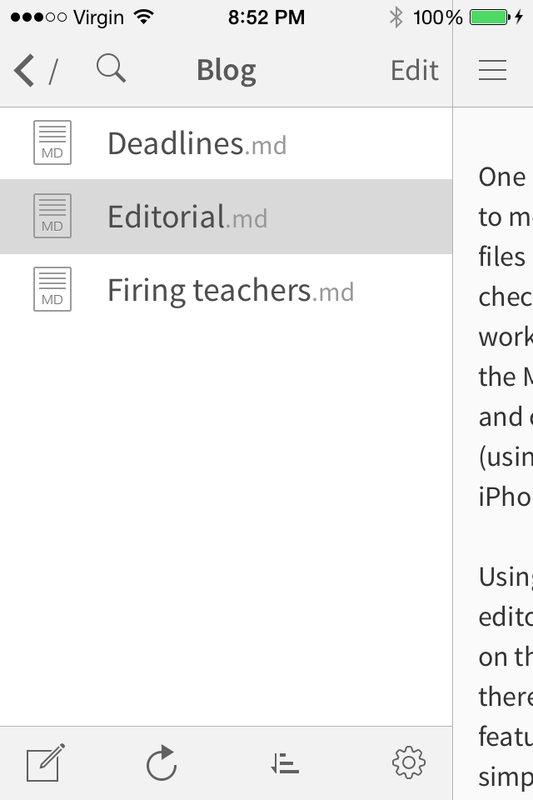 Must-have iOS app: Editorial last modified July 26th, 2014.